Most sprayers come with tank, heavy duty metal frame, pressure regulator for bypass and regulation, manual valves for boom or handgun control, lift pins, pressure gauge, roller pump, hand gun holder, hose wrape and quick coupler. AG SPRAY PALLETIZED SPRAYER 3 PT WITH HAMILTON NOZZLE 200 GAL Palletized 200 gal 3 pt. sprayer with hamilton nozzle. 200 gallon horizontal corrosion resistant polyethylene tank, heavy duty metal frame, nylon tank straps, tank braces for added tank stability, pressure head assembly, pressure regulator for by-pass and agitation, manual valves for boom or nozzle control, category 2 lift pins, 100 PSI liquid pressure gauge, hypro 8 roller pump with quick coupler, 43L-AL handgun with 25ft of 3/8in rubber hose, gun holder, and hose wrap. 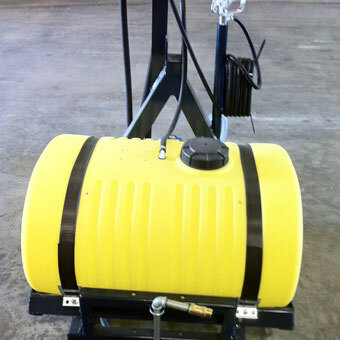 AG SPRAY PALLETIZED SPRAYER 3 PT WITH HAMILTON NOZZLE 55 GAL Palletized 55 gal 3 pt. sprayer with hamilton nozzle. 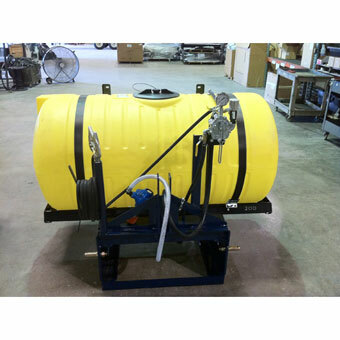 55 Gallon horizontal corrosion resistant polyethylene tank, heavy duty frame, nylon tank straps, tank braces for added tank stability, strainer assembly, pressure regulator for by-pass and agitation, manual valves for boom or nozzle control, category 1 lift pins, 100 PSI dry pressure gauge, hypro 6 roller pum with quick coupler, 43L-AL handgun with 25ft of 3.8in rubber hose, gun holder, and hose wrap. This AG South Gold Scorpion Series Tow Behind Sprayer SC15-TRLNS is great for applying insecticides, pesticides and herbicides. The 96" lead wire with the quick coupler, the in-line switch and the deluxe battery clips allows the operator to use the sprayer right away. The sprayer includes a 15-gallon low profile polyethylene tank, trailer and a two-nozzle spray boom with an 80" swath, handgun, and a 12-volt diaphragm with an adjustable pressure range. The dependable High-Flow pump has a 2.1 GPM and a 7 amp draw. AG South makes a full-line of top quality Gold Scorpion Series Sprayers: garden sprayer, lawn sprayer, farm sprayer, ATV sprayer, UTV sprayer, spot sprayer, pull behind sprayer and tow hehind sprayer. 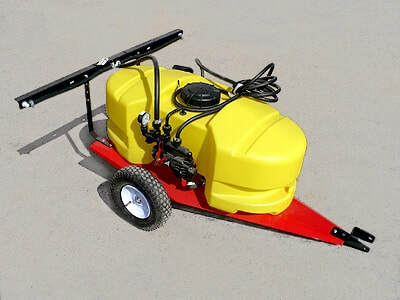 And we have these AG South Gold Scorpion Sprayers in stock and ready to go!